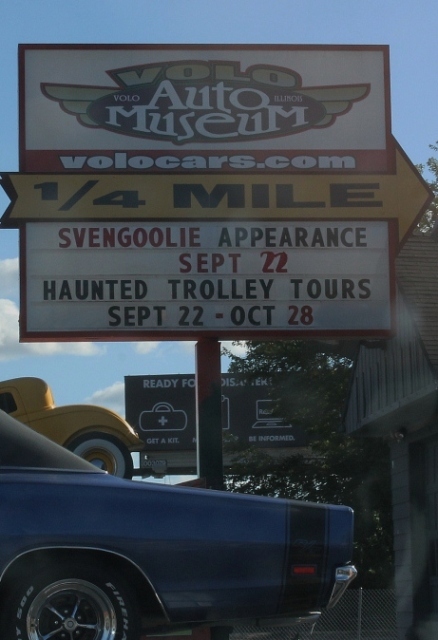 Geared up to see Svengoolie at The Volo Auto Museum! 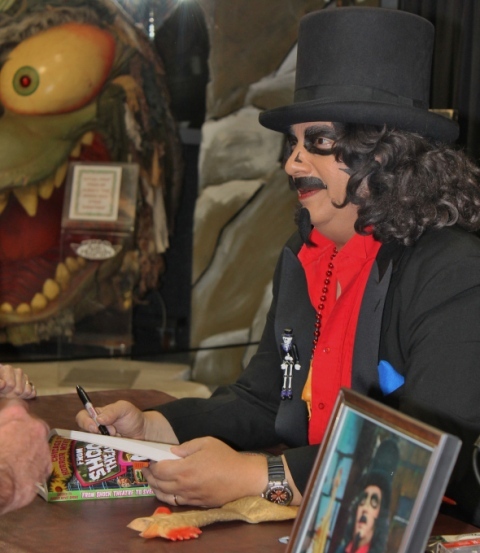 One of the most rewarding aspects of stalking National Horror Host, Svengoolie, is that (despite his hectic summer & fall schedule of appearances) he somehow manages to do new things each year! And if there’s one thing we obsessive fans love, it’s diversity! Another hidden benefit of Sven-Surveillance is that it succeeds in bringing you to places you might never consider visiting otherwise. Such was the case with Sven’s recent visit to The Volo Auto Museum. 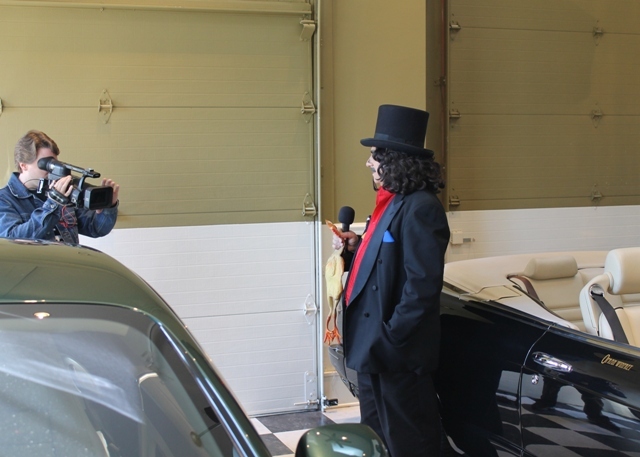 After 33 years, Svengoolie has risen to the height of Horror Host achievement by not only staying on the air in today’s less than host-friendly commercial TV world, but by going National via MeTV early last year. He’s a legend, and a busy one at that. I’m not too proud to admit that the man can run circles around me with his daily blogs, show tapings, and year-round appearances. 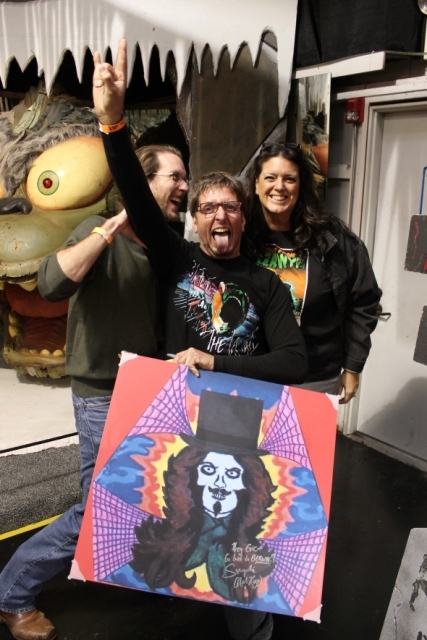 Thank Heavens I’m not alone in my fanaticism and can count on some great fellow Svengoolie fans to help me keep up! 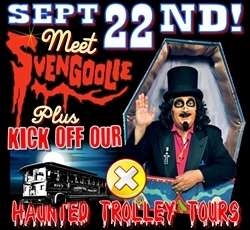 Angela Urban (whom I’ve written about before and has provided past coverage of events) was kind enough to not only notify me of this appearance, but also give me a not-so-gentle nudge to hurry up and buy my tickets for Svengoolie’s “Haunted Trolley Ride.” This was a special feature added to his Volo appearance and absolutely something I wanted to do. I’d already missed my chance to get tickets for his first scheduled ride and immediately took advantage of a second one that was added later. For those who have never gone to a Svegoolie appearance, the usual time allotted for his signings is about 2 hours but, in lieu of the trolley rides, would only be 1 hour at this one. I’d made up mind that I was not going to take up any precious line space to meet him; giving other fans an opportunity to meet him for the first time as opposed to my 50th (aside from that, I think I’ve had him sign just about everything at this point, short of my phone book). Angela and her husband, Ron, were of like mind and we were delighted that The Volo Auto Museum appeared to design his designated area with us in mind. There was a table set up for Sven, an area for his autograph line, and sets of benches off to the side ideal for us Svengoolie spectators! As the line steadily grew, we happily assembled in our own Horror Host cheering section. Adding to the fervor was a young fan dressed like Sven. 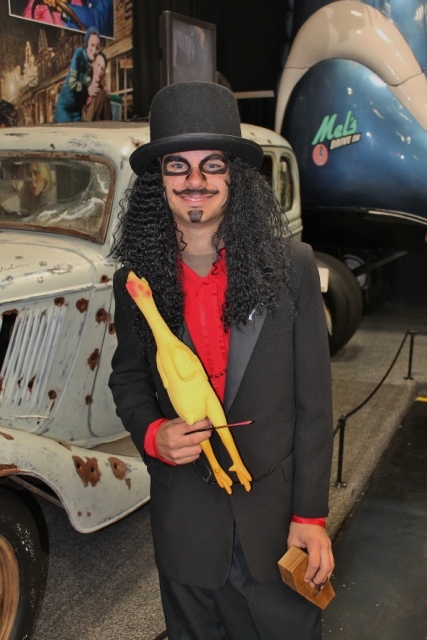 His name was Christian and he said that he’d been a fan of Svengoolie for the past two years. Christian particularly enjoys the way Sven humorously brings viewers back to a movie after commercial breaks! 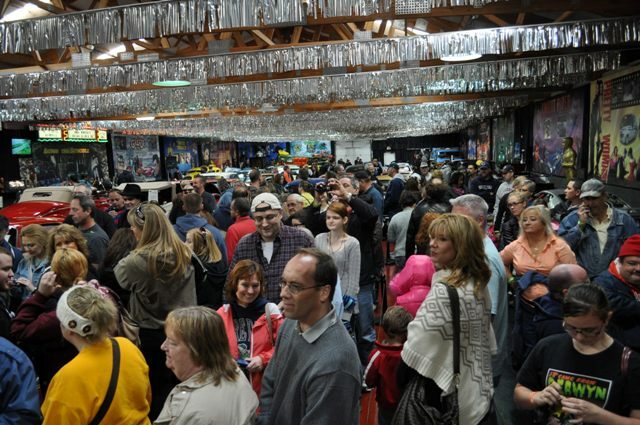 As fans flooded in, I was delighted to see the author our post on Volo’s George Barris Charity Show (story HERE), Joan Yingst, show up with her husband, Bill. I last saw her briefly at Sven’s Horrorbles appearance (story HERE) but didn’t have time to chat. I introduced her to Angela and, in turn, Angela introduced me to a few of her friends too. Eventually these appearances will be highlighted by a group of us super-fans all dressed to the nines, wearing white gloves (to match our Sven shirts), while hobnobbing like socialites at a the latest debutante ball. I tried to encourage Joan to scream like a Beatles fan when Sven entered the building but apparently she thought I was kidding because she remained subdued when the host arrived. Another fan brought Sven a large picture of the artwork featured on his coffin. When I attempted to ask him about it, he acted like I was ready to sue him for copywrite infringement. Eventually he warmed up and posed for a picture with his friends (accomplices). The signing ran a bit late, delaying the trolley rides. While we waited our turn, we bumped into yet another super fan, and Terror Dave favorite, Jamie Lee Cortese! 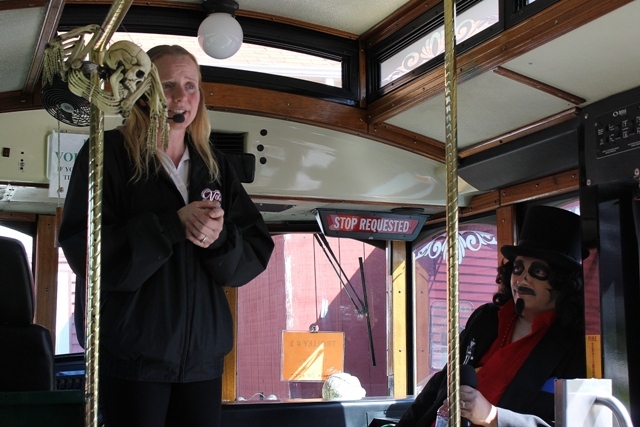 It turns out she also had tickets for the second trolley ride making this tour seem like a ride on the Svengoolie/Partridge Family bus! 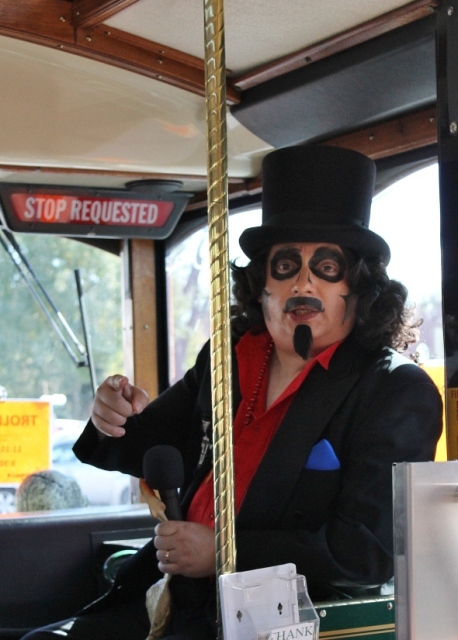 We eventually boarded with Svengoolie sitting in front next to Liz, the driver/narrator. 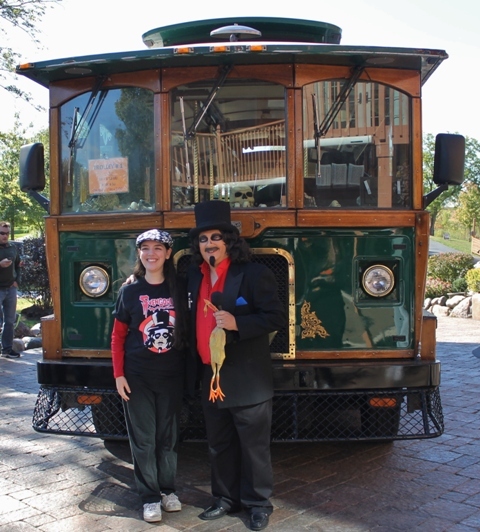 You can’t say we weren’t driving in style as this trolley was a $270,000 replica of a 1915 Victorian model! Narrator, Liz, spins a scary yarn! 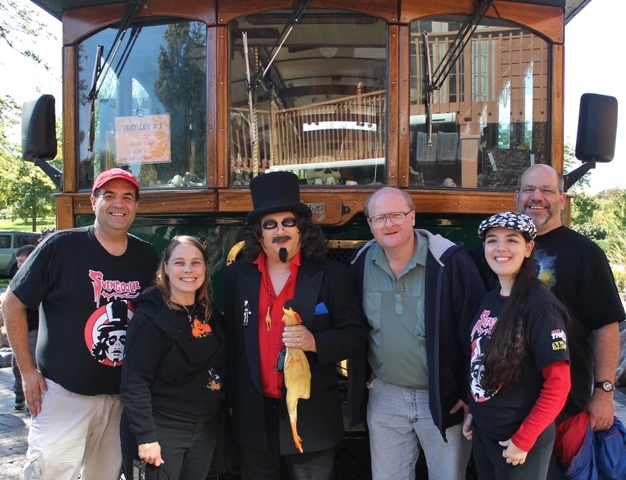 Afterwards we posed for pictures and I was highly energized with the first leg of Svengoolie’s 2012 Fall Tour! 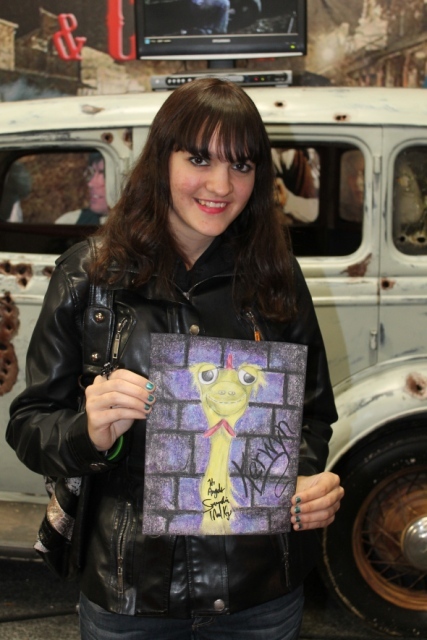 This entry was posted in Horror Hosts, Stalking Svengoolie! 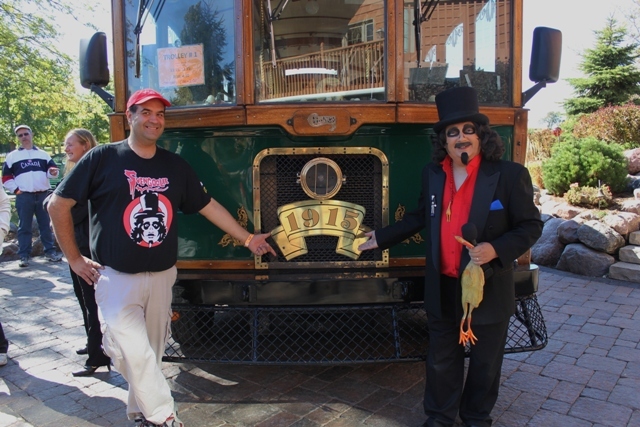 and tagged Haunted Trolley, Oprah Winfery, Svengoolie, Svengoolie on the Road, VOLO AUTO MUSEUM. Bookmark the permalink. Thanks for the report on this fun-sounding event, Dave. Being “geographically challenged” as I like to say (I live in North Central Florida), the chances of me getting to ANY of these happenings up in that area are pretty remote. So anytime you post write-ups of this sort on your blog, it at least makes me feel a liitle bit like I was a part what went on. Thanks again!